The entrance sign for the Chickamauga Lock is photographed on Tuesday, Aug. 11, 2015, in Chattanooga, Tenn. Despite a new calculation last year that cut the benefit-cost ratio for the new Chickamauga lock, construction of the new and bigger lock in Chattanooga remains one of the top priorities among new federal inland waterway projects. In its 20-year capital investment strategy released last month, the U.S. Army Corps of Engineers maintained the new Chickamauga lock as its fourth highest priority among new locks and dams under construction in the United States. The Chickamauga replacement lock, which is about one-fourth complete, trailed only the Olmsted Locks and Dam on the Ohio River, the Monongehela River projects in Pennsylvania and the Kentucky Lock addition on the Tennessee River in the Corps' assessment of the need to finish the projects. 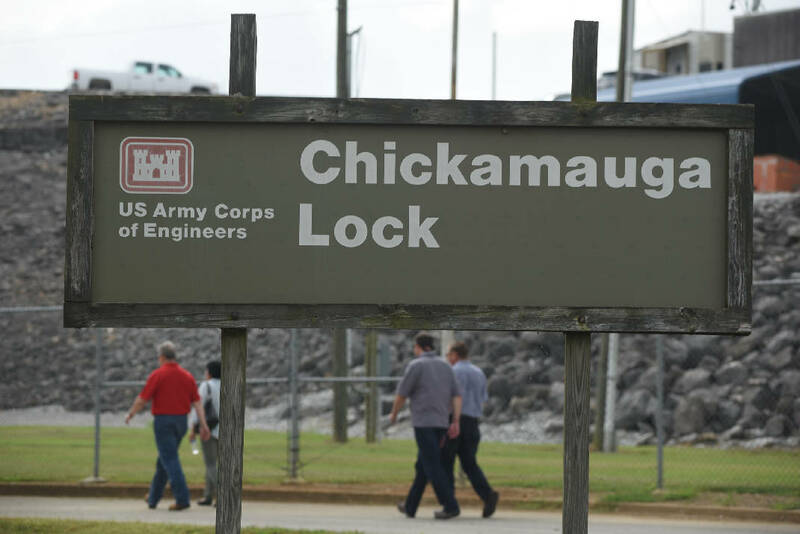 "This is one more piece of good news for the replacement of Chickamauga lock," U.S Sen. Lamar Alexander, R-Tenn., chairman of the Senate Appropriations Subcommittee on Energy and Water Development, said Thursday after the Corps report was released. "If the Corps of Engineers plan had dropped Chickamauga lock out of its fourth place priority, there could have been no possibility of funding it for the foreseeable future." Alexander has worked to complete the new Chickamauga lock to avoid a potential cutoff of the upper third of the Tennessee River if the existing, 76-year-old lock continues to crumble and has to quit operating. Congress agreed to raise the barge diesel fuel tax by 9 cents a gallon to help improve funding for the Inland Waterways Trust Fund which pays for projects like the new Chickamauga lock. "Hopefully, we can continue funding the Inland Waterways System sufficiently, so that there is money each year to continue funding the lock," Alexander said a a statement Thursday. Because the volume of river shipments in Chattanooga has declined while the cost of completing the new Chickamauga lock has gone up, the benefit-to-cost ratio for the project fell last year to 0.5 to 0.8, down from the 3.0 ratio in a 2009 analysis. Benefit-cost ratios below 1 usually do not meet Corps criteria for funding. The current lock at the Chickamauga Dam, which was unknowingly built with faulty concrete in the 1930s, suffers from concrete growth that threatens the operation of the upper and lower gates. A decade ago, the Corps began building a replacement lock, but work stalled for three years when money ran short. The new lock is getting $30 million of funding this year, according to Corps budget estimates. The annual allocations scenario presented to Congress by the Corps does not inlcude funding after this year for the Chickamauga lock until fiscal 2020 when the project is projected to get $87 million. The new lock, which will be 110 feet wide and 600 feet long, will be more than three times the size of the existing lock and will be capable of handling multiple barges at a time. Alexander said the bigger size and more reliable service from the new lock should boost river shipments and improve the benefit-cost ratios. The Corps estimates building the new 600- by 110-foot lock below the Chickamauga Dam will end up costing an estimated $828.9 million. Contact Dave Flessner at dflessner@timesfree press.com or at 423-757-6340.